Shinjuku is an urban centre around the Shinjuku station in west Tokyo. It consists of an eastern part focused mostly on entertainment and shopping, and a western part with a skyscraper district with some very impressive architecture. 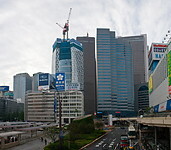 Among the skyscrapers are the Tokyo city hall, the Sumitomo and Mitsui buildings and some leading hotels, such as the Keio Plaza, Hilton, Century Hyatt and Park Hyatt.